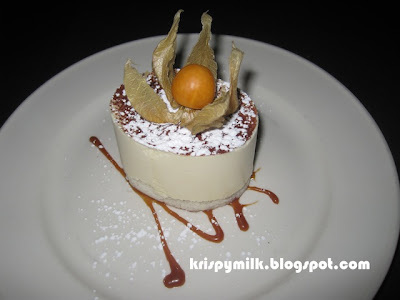 Cafe Il Nido is an elegant yet casual restaurant offering authentic Italian cuisine. When I walked in, I was greeted but no one asked if I had a reservation or offered to lead me to a table. After standing there for several minutes, I was finally seated at a table and given the menu. It was difficult to read since the lighting was quite dim. I think the restaurant is trying to achieve a romantic ambiance with candlelights in fancy tealight holders on the tables. After a short while, the waiter came by and asked about drinks. I asked for hot water and got it in a small teacup. My issue with the cup was that the ear had a funky design and I couldn't put my finger through it, making it very difficult to hold. 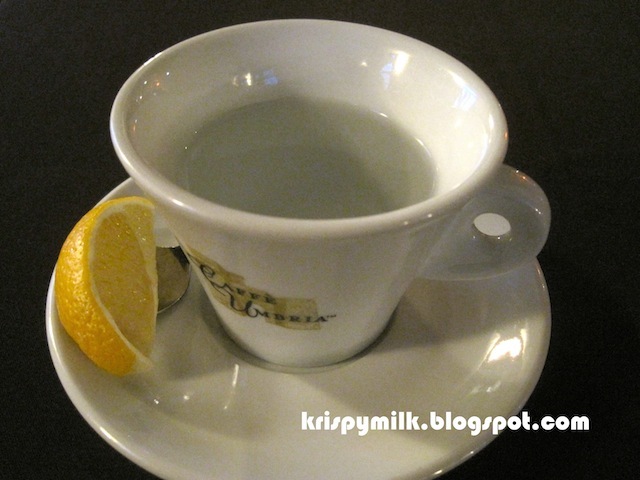 What an awkward cup design, especially for hot liquids! 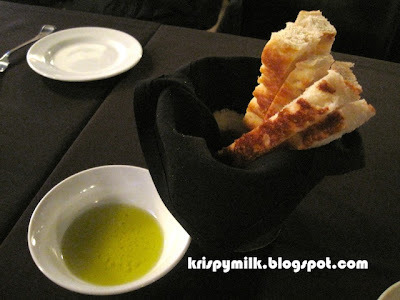 After we placed our orders, the waiter gave us a basket of focaccia along with olive oil dip. The bread was already quite oily and tasty by itself, so I passed on the olive oil. 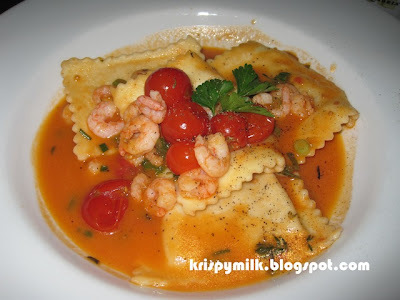 I ordered the agnolotti ($22) which was lobster-filled ravioli with cherry tomatoes and shrimps. It was served in a rich and creamy sauce that tasted just like lobster bisque. The portion was small with only 4 large pieces of ravioli, probably because the dish was so rich that it would be difficult to eat more than that. 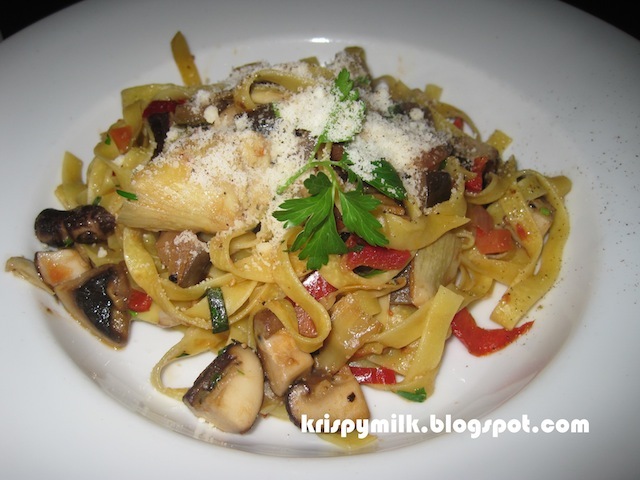 Mom opted for a healthier option: the vegetarian fettucine ($15) with mushrooms and red peppers. It was flavourful but not as rich as the other 2 dishes. I found the fettucine a bit undercooked though, as it tasted slightly dry and hard. 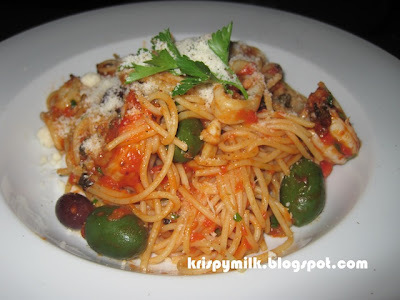 Dad ordered the spaghettini puttanesca ($18), a seafood pasta with spicy tomato sauce. It was probably the best choice since the flavour was just right, not too rich and not too plain. The spaghettini was cooked perfectly with a variety of seafood and vegetables including calamari, prawns, capers, garlic, anchovies and olives. We ordered a tiramisu ($8) to share, and I'm glad we did! I'm not crazy about tiramisu, but still found this really good. A lot of tiramisu these days are more like mousse than cake. This one had just the right balance between coffee-soaked cake and mascarpone. The cake was moist but not soggy, and the cream was smooth and rich. The gooseberry on top was juicy and fresh as well, not dry and shriveled-up like in many other places. Service was not impressive, but the pasta and tiramisu were really authentic and tasty.